What is this Typhonian Tradition and how is it linked to the Merovingian/Grail Bloodline and the Priory of Sion as described in Michael Baigent, Henry Lincoln and Richard Leigh’s book The Holy Blood and the Holy Grail? According to Kenneth Grant, a leading exponent of this Typhonian Tradition,and head of the Ordo Templi Orientis (a magical organization that was once headed by the one and only Aleister Crowley) this tradition is part of a current of magical force and occult lore dating back to Sumeria and pre-Dynastic Egypt. Originally known as the Draconian Tradition it is a magical current “based on initiated knowledge or gnosis of the Fire Snake.” The Fire Snake is also known as the Kundalini or the Ophidian Current; the basis of all true initiation. 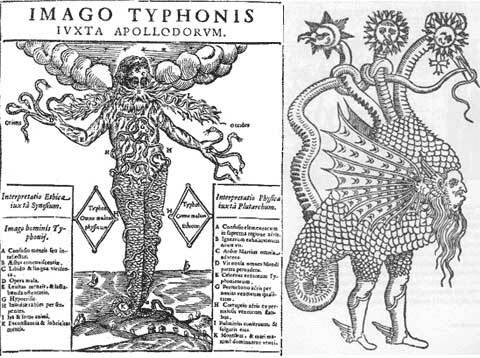 Left: "Typhon" (A. Kircher, Oedipus aegyptiacus) from: blasderobles.com. Set was the “black god”. He was known as “he who is below.” He was banished to the underworld by his “twin” Horus for killing Osiris. The Nephilim were banished to the center of the earth for disobeying God by mating with the daughters of men and teaching them the “forbidden” arts. In this publication the Nephilim have been identified as the Fathers of the Merovingians. Set was generally considered to be a vile, vicious god baneful to men. But there are enough aspects of this god that link him to the ancient Sumerian myths, the basis of the Merovingian mythos published in this magazine, to show that Set is to be identified with the same gods and characters that make up these Mythos. He may have been considered baneful towards some races, but not the race of the Grail. In E.A. Wallis Budge’s book The Gods of the Egyptians, Set is identified as a personification “of the forces of the waters which were supposed to resist light and order. A number of beasts which dwelt in the water, were regarded as symbols of him and of beings wherein he took up his habitation.” We will recall that the Merovingian race was sired by a water beast known as the Quinotaur. This Quinotaur took the form of a sea-bull. Crowley’s personal seal was of a sea goat. Grant, writing of Crowley’s Seal of the Beast, says: “The beast is the sea-goat or amphibious monster identical with Cthulhu, the Quinotaure or Bull of the Deep.” Grant writes as a footnote; “The waters under the earth; home of the ‘ancestors’ or subconscious atavisms of the race.” Is this a reference to the race of the Grail? Grant, writing of the cross of the four corners says; “The intersection of this surface (horizontal and vertical ) represent, therefore, the gateway to another dimension, the waters beneath the earth that mirror in their uncertain depths the heights of space above the earth wherein glow the stars, the unborn or un-fleshed souls of future states of consciousness, or simply life beyond earth. The mortal world spreads east and west and the land of le invisibles lies above and below it in the vertical dimensions of height and depths, north and south, Horus and Set.” This ties in with The Book of Enoch and the Hosts above and the fallen, banished Nephilim below. This also reminds us of the twins or brother gods in Sumeria called Enki and Enlil. Enki, the infernal of the two, represents Set and Enlil represents Horus (although in this context Enlil would also be Osiris). In ancient mythologies names and stories can be switched and one god can also be an attribute of another. It’s best to keep this in mind when studying this type of material. Set kills Osiris as Enki kills Enlil. As it has been shown in another article of this publication, Enki is associated with Cain, and Cain was a very bad boy. Enki was an infernal god that has been identified, in this publication, as siring the Merovingian race. Grant, writing of the “eye of the void” of a primal African cult says: “This void was known as Elemi, a name which is said to be incommunicable. It was the equivalent of El or Al , continued in the Draconian Cults as El Shaddai or Al Shaitan, the stellar deity worshipped by the Arabs and the Jews and by the earliest settlers in Sumer (in Sumeria the god El is also known as Ia) Alemi or Alhim became the Elohim of biblical lore. These gods or cosmic powers poured through the Veil of the Ain- the all seeing eye- which has its human analogue in the ajna chakra, concentrated in the first power zone-Kether.” The Elohim are messengers from on high bringing “knowledge” down for mankind, similar to the Nephilim. They are also associated with Set, or the Chaldean form of Set, Shaitan. Writing of the Great Old Ones or Elder Gods from Lovecraftian lore, Grant says, “The letter M, the key vibration of the plane of the Elder Gods, is represented mythologically as the sea-goat, Makaru or as the crocodile, the beast of the waters.” Couldn’t Makaru be a form of Merovee who spawned the Merovingians, and was sired himself from a sea-bull? Tracy Twyman has already written of the connections between Lovecraft’s Necronomicon Mythos and the Merovingians in her article Dead But Dreaming: The Great Old Ones of Lovecraftian Legend Reinterpreted as Sumerian/Atlantean Kings. Now we come to the Qlippoth. The Qlippoth are denizens of the back side of the Tree of Life. This back side or dark side is said to be behind the regular Sephirah of the Qabalah. They are said to be the shells or the husks of the dayside of the Tree. But according to Kenneth Grant they are actually the first, primal manifestation of all things. In terms of Lovcraftian lore they are the Ancient Ones or Great Old Ones of the Necronomicon. They are the first primal void of Nothing before there was something. They have been considered evil by Qabalists and Occultists for centuries only because they represent the terrible blackness of the void and the complete destruction of what we understand as ego, which seems horrific to us. These Qlippoth reside in what is known as the Tunnels of Set. These Tunnels are behind or beneath the Day Side of the Tree of Life as the Nephilim reside beneath the earth. As terrifying as these “beings” may seem, Grant says they are here to enlighten us, as the Nephilim were. Why is the abode of these beings called the Tunnels of Set? Grant writes; “Of Set, because Set is the Seat of the powers manifest as the Tree of Life.” This is what is known as the Typhonian Tradition that Kenneth Grant speaks of. 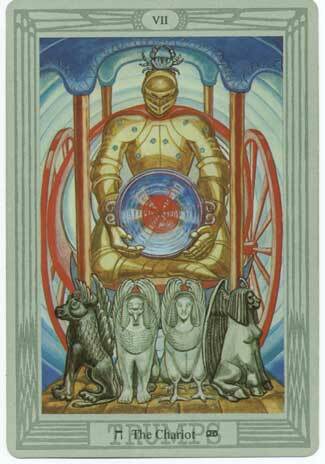 Crowley’s design of the Chariot card in his Tarot Deck depicts a Knight (Templar?) holding a disk that represents the Grail. Anyone having read The Holy Blood and the Holy Grail would know that the Templars were Knights pledged to defend the Merovingian/Grail Bloodline. Grant says, in a footnote; “it should be noted that the Graal-Bearer [represented on the Tarot card] is depicted in amber-coloured armor [amber or red, the color associated with the Merovingians]. Amber or Orange appears repeatedly in accounts of UFO sightings.” Crowley, in his Book of Thoth, writes; “The Charioteer is clothed in the amber-coloured armor appropriate to the sign. He is throned in the chariot rather than conducting it, because the whole system of progression is perfectly balanced. His only function is to bear the Holy Grail.” Grant writes, “The bearer of the Graal [Knight Templar?] depicted on Atu VII [the Tarot card] may therefore be identified with the bringer to earth of the Sangraal, or blood royal, the blood which flows in the veins of the Kingly Man extolled by Crowley, although not understood by him in the sense of trans-human Intelligence. Crowley’s design for the Graal resembles as closely as may be, for a pre-1947 representation, a shape frequently described in connection with particular types of UFO.” Pre-1947 because, as Grant says, that year was the modern explosion of accounts of UFO “sightings” around the world. I am not partial to the literal belief in UFO’s. I believe, as Dr. Carl Jung believed, that these UFO sightings are a product of our unconscious veiling of an ancient human experience. Enough said. This “bringing to earth” of the Sangraal by UFO’s is the modern day equivalent of the Nephilim, the Outer Ones, or the Elohim earthling “knowledge” and siring a new race of “kingly” beings for this world. Kingly i.e., the Merovingians. The Merovingian blood is the blood of kings, the kings or gods from ancient Sumeria and beyond. 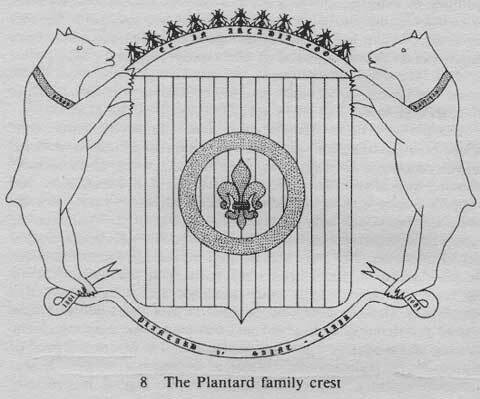 In his book Outer Gateways Kenneth Grant writes: “In The Holy Blood and The Holy Grail, the authors reproduce the family crest of Clan Plantard, the contemporary representative of which was, until recently, the Grand Master of the Prieure de Sion, an Order which, according to Lincoln, dominated the Order of the Knights Templar and various other highly influential institutions which, at certain periods of history, included the Vatican. The crest which supplies the key to the Current represented by the Merovingian bloodline and the Order of Sion, comprises the symbols of the Typhonian line of descent: the two bears, eleven bees, and the fleur de lys. The motto incorporated in the crest reads Et in Arcadia ego (Ed Note: See top pic.). Arcadia=127, which is the number of the Egyptian Goddess Heqt who was typified by the ‘lower part of the back, or haunch.’ The two bears denote the Mother (Typhon) and her son (Set). The image of the bee pictorializes the buzzing or humming vibration peculiar to the Outer Ones, or their vehicles. Eleven is the number of Those who are Without, or beyond, the Tree of Life, thus identifying the Outer Ones.” The Outer Ones are also the Qlippoth or the Ancient Ones of Lovecraftian lore. That the Typhonian Tradition and the Merovingian Tradition share the same important symbols seems to be much more then a mere coincidence. In the Typhonian Tradition the Bear is the constellation of Ursa Major. The stars must be aligned in a specific way in order for Set to be properly invoked. To the Priory of Sion (the secret, occult organization dedicated to preserving the Merovingian Bloodline), the Bear was an animal of the Goddess Diana. According to Lynn Picknett and Clive Prince, the authors of The Templar Revelation, “ …the Merovingian kings, from their founder Merovee to Clovis (who converted to Christianity in 496) were ‘pagan kings of the cult of Diana’.” Picknett and Prince got this information from the Dossiers Secrets of the Priory of Sion. 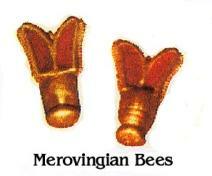 The bees, which are a recurring symbol of the Merovingians are, in the Typhonian Tradition, represented frequently as the humming or buzzing sound that occurs before the appearance of the Great Old Ones or “beings” proper to this tradition. Grant writes “The bee, beetle, or crab, is therefore the link between the earliest manifestation of the Typhonion current and its final phases.” Also; “217 is the key number of [Crowley’s] The Book of the Law. 217 is also the number of DBVRH, meaning ‘a bee’ which is the specific symbol of Sekhet, whose name means ‘a bee.’ Sekhet is another aspect of the god Set. There are eleven bees because eleven is the number of Magick and of the sephirah on the Tree of Life, called Daath, which is the “Gateway” to the backside of the Tree and to the Gods. Kenneth Grant’s wife Steffi Grant illustrated the cover of her husband’s book Beyond the Mauve Zone with an image of two bees holding a crystal. As for the fleur de lys, in the Typhonian Tradition it represents the ‘kingly man’ that Crowley extols and the inheritor of the Grail Bloodline. In The Vision and the Voice, Crowley is “conversing” with his Holy Guardian Angel Aiwass, who says: “For I am not appointed to guard thee, but we are of the blood royal, the guardians of the Treasure-house of Wisdom”: the “blood royal,” the Sangraal of the Holy Grail. Throughout all of Kenneth Grant’s books there are references to ideas, archetypes, and images related to the Sumerians, the Merovingians and especially to the mythos that Tracy Twyman has been uncovering in this publication. There are references that I haven’t even mentioned. For instance, the bat wings discovered at Rennes le Chateau that in the Typhonian Tradition represent the inversion of the senses that lead to enlightenment and occult knowledge. I agree with Grant that Henry Lincoln’s research has “illumined certain phases of an ancient myth-cycle intimately associated with the Typhonian Current.” It seems that the farther down this road we go, the closer we get to the truth. "The beehive is found in Masonry as a reminder that in diligence and labor for a common good true happiness and prosperity are found. The bee is a symbol of wisdom, for as this tiny insect collects pollen from the flowers, so men may extract wisdom from the experiences of daily life. The bee is sacred to the goddess Venus and, according to mystics, it is one of several forms of life which came to the earth from the planet Venus millions of years ago. Wheat and bananas are said to be of similar origin. This is the reason why the origin of these three forms of life cannot be traced. The fact that bees are ruled by queens is one reason why this insect is considered a sacred feminine symbol. In India the god Prana--the personification of the universal life force--is sometimes shown surrounded by a circle of bees. Because of its importance in pollenizing flowers, the bee is the accepted symbol of the generative power. At one time the bee was the emblem of the French kings. The rulers of France wore robes embroidered with bees, and the canopies of their thrones were decorated with gigantic figures of these insects. The fly symbolizes the tormentor, because of the annoyance it causes to animals. 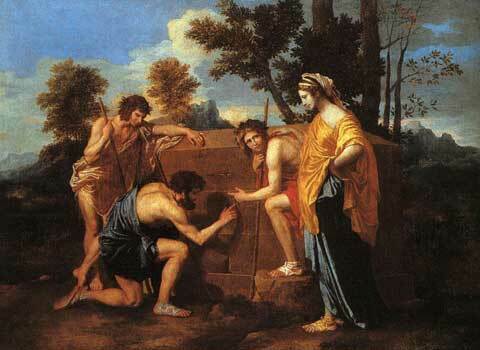 The Chaldean god Baal was often called Baal-Zebul, or the god of the dwelling place. The word zebub, or zabab, means a fly, and Baal-Zebul became Baalzebub, or Beelzebub, a word which was loosely translated to mean Jupiter's fly. The fly was looked upon as a form of the divine power, because of its ability to destroy decaying substances and thus promote health. The fly may have obtained its name Zebub from its peculiar buzzing or humming. Inman believes that Baalzebub, which the Jews ridiculed as My Lord of Flies, really means My Lord Who Hums or Murmurs." House of Vere & the Merovingians, an Antediluvian Dragon Bloodline?